Unlike their wasp ancestors, most ants travel by walking, though some species are capable of leaping. As an example, the jumping ant (Harpegnathos saltator) is able to make leaps by synchronising the action of its mid and hind pairs of legs. There are several species of gliding ant including Cephalotes atratus. Gliding appears to be a common trait among most arboreal ants. Ants with this ability are able to control the direction of their descent while falling through the air. Other species of ants can form chains to bridge gaps over water, underground, or through spaces in vegetation. This ant bridge was photographed by Jacinda Brown. Humans, observing the ants' accomplishment, have attempted to make bridges of their own with varying degrees of success. The Milvian (or Mulvian) Bridge (Italian: Ponte Milvio) in northern Rome, Italy, is one of the most important bridges over the Tiber. The bridge was built by consul Gaius Claudius Nero in 206 BC, after he had defeated the Carthaginian army in the Battle of the Metaurus. Wanting to go him one better, in 115 BC, consul Marcus Æmilius Scaurus built a new bridge made of stone in the same position, demolishing the old one. When I saw the Ponte Vecchio Bridge in Florence, Italy, I thought it looked dangerous. It seems at least possible that I was wrong, considering the fact that this Medieval bridge over the Arno River has been there for quite some time. It was first built in Roman times and was destroyed by floods and rebuilt in 1117 and again in 1333. It was rebuilt again in 1345. Sheltered in a little loggia at the central opening of the bridge is a weathered dedication stone: "In the thirty-third year following thirteen hundred, the bridge fell, from a watery flood: ten years later, at the pleasure of the Commune, it was rebuilt, with this adornment." It has always been noted for having shops built along it, though those on the upriver side weren't added until the 17th century. It is said that the economic concept of bankruptcy originated here: when a merchant could not pay his debts, the table on which he sold his wares (the "banco") was physically broken ("rotto") by soldiers, and this practice was called "bancorotto" (broken table). Not having a table anymore, the merchant was not able to sell anything. A 4 meg impressive panorama of the side of the bridge opposite to this view. This enclosed bridge is made of white limestone and has windows with stone bars. It passes over the Rio di Palazzo and connects the old prisons to the interrogation rooms in the Doge's Palace. It was built in 1602. The view from the Bridge of Sighs was the last view of Venice that convicts saw before being imprisoned. The bridge's name, given by Lord Byron in the 19th century, comes from the suggestion that prisoners would sigh at their final view of beautiful Venice out the window before being taken down to their cells. In reality, the days of inquisitions and summary executions were over by the time the bridge was built and the cells under the palace roof were occupied mostly by small-time criminals. Also, one could barely see any view from inside the bridge due to the stone grills covering the windows. The Pont Neuf (New Bridge) is the oldest standing bridge across the river Seine in Paris, France. Its name, which was given to distinguish it from older bridges that were lined on both sides with houses, has remained. The bridge was completed under the reign of Henry IV, who inaugurated it in 1607. All through the 18th century, the Pont Neuf was the centre of Paris, lively with both crime and commerce. The Bridge of Sighs in Cambridge is a covered bridge belonging to St John's College of Cambridge University. It was built in 1831 and crosses the River Cam, between the college's Third Court and New Court. It is named after the Bridge of Sighs in Venice, although they have little architecturally in common beyond the fact that they're both covered. The bridge is one of Cambridge's main tourist attractions and Queen Victoria is said to have loved it more than any other spot in the city. By the 19th century, bridge-building had come a long way. The original Kintai Bridge was built in 1673 but collapsed due to flooding. The rebuilt bridge survived for more than 200 years until a typhoon destroyed it in 1950. The bridge that stands over the Nishiki River now has 5 wooden arches displaying an incredible amount of detail and craftsmanship. Interesting fact — originally no nails or bolts were used to build the arches, achieved by the careful fitting of the wooden parts and by building up thick girders by clamping and binding them together with metal belts. The shape and weight of the bridge made it extremely strong from the top, but incredibly weak from underneath. Flood water rushing along the river would simply lift the bridge up and wash it downstream. In 1953, the bridge was once again reconstructed using very similar techniques to the original; however, they used metal nails to increase its durability. This 1953 reconstruction, partially restored in 2001 and 2004, still stands today. Pittsburgh is one city which is hugely dependent on bridges. This photo, taken in 2005, is by the late Kate Wassner (who died of bone cancer in 2007). The Millau viaduct is the world's tallest bridge. It is part of the A75 highway that links Paris to the Mediterranean. It took over 3 years to build. The highway is suspended 250 metres (820 feet) over the Tarn River. Creeping closer inch by inch, 900 feet above the Colorado River, the two sides of the bridge at the Hoover Dam slowly take shape. The bridge will carry a new section of US Route 93 past the bottleneck of the old road, which can be seen twisting and winding around and across the dam itself. The new road will be supported on the two massive concrete arches which jut out of the rock face. The arches are comprised of 53 individual sections, each 24 feet long, which have been cast on-site and are being lifted into place using an improvised high-wire crane strung between temporary steel pylons. Once the arches are complete, the suspending cables on each side will be removed. Extra vertical columns will then be installed on the arches to carry the weight of the road. The dam was started in 1931 and used enough concrete to build a road from New York to San Francisco. 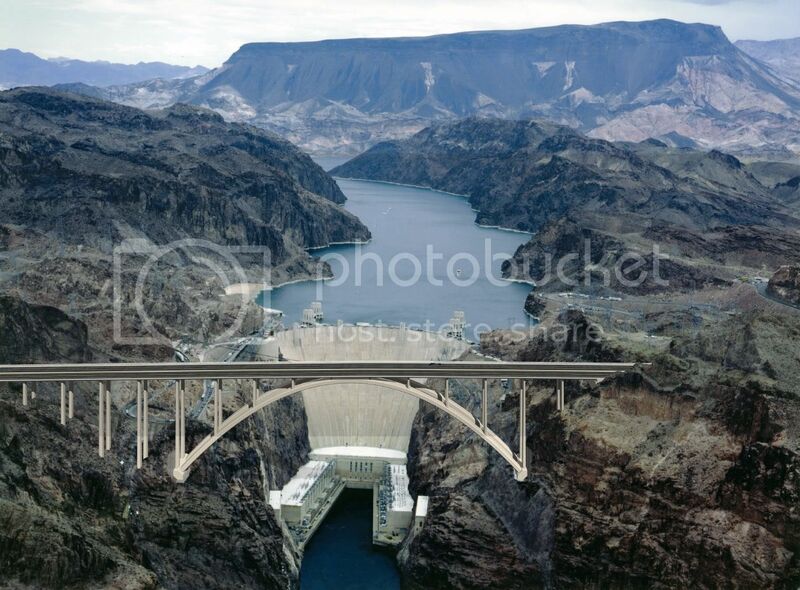 The stretch of water it created, Lake Mead, is 110 miles long and took 6 years to fill. Around 1,300 people have lost their lives jumping off the Golden Gate Bridge. The 250-foot fall takes about 4 seconds and a National Public Radio documentary focusing on the last thoughts of the 26 survivors revealed that they basically all felt sharp regret as they fell. Why is it that the Golden Gate Bridge attracts so many more jumpers than the high bridges in New York? The George Washington Bridge's sidewalk is about 300 feet above the river, yet it attracts 10 jumpers per year compared to the Golden Gate's 25 — 30. (My son thinks the colour of the bridge may have something to do with it. My thought was the temperature of the water — which doesn't make as much sense, once I consider it, since Seattle's George Washington Memorial Bridge is the second deadliest suicide bridge in the US and its water is as cold as New York's. Besides, why would a suicide jumper care? The fact that the vast majority of jumpers take their last step facing east toward San Francisco instead of west toward the Pacific may offer a clue.) Suicide barriers on bridges apparently don't reduce overall suicide rates by jumping from heights, as people often just change locations for their attempt. Suicide barriers erected to prevent jumping have been established at the Empire State Building in New York City, the Eiffel Tower in Paris, and bridges worldwide. But no study has shown that a barrier has led to a statistically significant drop in overall suicide rates in an area. 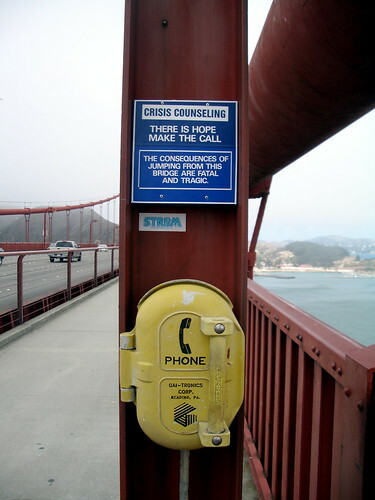 Special telephones with connections to crisis hotlines are sometimes installed on bridges. What if you decide to make that call to a crisis hotline instead of jumping and you open the door and see this? Is this real? Or a joke? (Every year, about 50 people are persuaded not to jump off the bridge, usually by the California Highway Patrol or by Golden Gate patrol officers. I don't know how many are talked out of it by crisis counsellors speaking to people using telephones on the bridge itself. I'd guess none if the phone doesn't work.) Oddly, while most bridge crisis phones connect to a crisis centre, the Golden Gate phones ring the bridge authority. My conclusion? I think the photo above IS a joke. Unfortunately, the photos on the left and right are not. These photos are verified, whereas I could find nothing about the photo above, though it appears several places on the internet. The verified photos show a phone box taped completely up while the photo above required the photographer or prankster merely to tape on a sheet of paper to the inside of the box. But why would any incidents of out-of-service occur? Perhaps vandals destroy the phones hoping that'll prevent even one jumper from being stopped? Maybe a jumper destroys the phone when he is shocked to find himself speaking to the bridge authority rather than the counsellor he expected? San Franciscans joke about bridge suicides in the offhand way they poke fun at a losing ball team or a scandal-tinged public official. Richard Seiden, professor emeritus of behavioural science at UC Berkeley, remembers a greeting card he found in a gift shop. On the outside was a pen-and-ink drawing of the bridge. On the inside, the sentiment: "Don't jump to conclusions!" Poison, drugs and wrist-slashing are all potentially fatal, but in each case a window of time allows victims to have second thoughts. With death imminent, their lives may seem more valuable or the cost of their deaths to family and friends too high. So they call 911, a friend, or a relative. With a leap from the bridge, second thoughts are useless. Many jumps from bridges are made on a whim, meaning someone walking or driving on the bridge suddenly thinks, "What the hell," stops the car, and impulsively cartwheels over the ledge. At the gate of the setting sun. Is the first image of another "bridge to nowhere"? This one is in the Ukraine, taken in 2008. This site has photos of more than a dozen bridges that, for various reasons, were begun but never finished. Frederic Larson, who took the photo on the right, has taken a series of shots of the moon around San Francisco, all lovely. The first of the V Bridges photos, "A Troubled Bridge over Water", is by Taurus 13. The second is a different (unknown) photographer, different season, and different position — but obviously the same unfinished (or deteriorating?) bridge. The third is the Brooklyn Bridge with mammatus clouds by Ben Brown. The first of the Arching Bridges, "Arches with Shadows" by Veselina Valcheva, I discovered (after a bit of research) isn't a bridge at all, but the Olympic Sport Complex in Athens — but I included it anyway because I like the shape and pattern). I haven't a clue where the second arching bridge is located, but at least it's obviously a real bridge. The third arching photo is of the Twin Bridges in Latham, New York by Neil Shapiro. The first of the Bridges for Boats photos is the Harderwijk in the Netherlands (a search on Google Maps gives a stunning satellite view). The Dutch Gouwe is similar, but I couldn't find a very good photo. Wikimapia has a good satellite view but I couldn't seem to get rid of the annoying polygons without registering. (Maybe you can figure it out.) 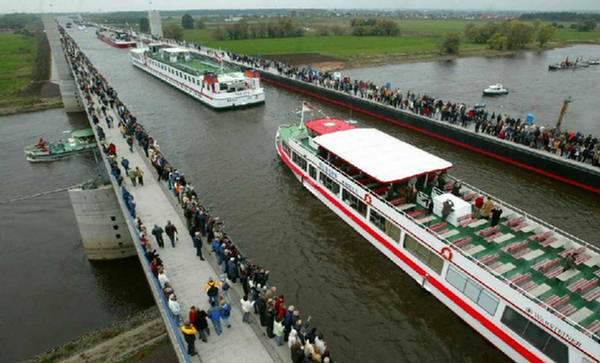 The second photo shows the Magdeburg Canal Water Bridge, a navigable aqueduct connecting the Elbe-Havel Canal to the Mittellandkanal ("Midland Canal"), crossing over the River Elbe. This was first planned in 1919; by 1938 the lift and bridge anchors were in place but construction was postponed during World War II. Next, the Cold War split Germany, so the project was put on hold until reunification. Did the bridge have to be designed to withstand the additional weight of ship and barge traffic? No — because ships and barges displace an amount of water weighing the same as they do, regardless of how heavily they're loaded. The third photo is the Huigsloterdijk crossing over the E19 Rijksweg in (near?) Amsterdam. The first of the Substandard Bridges is called "A Bridge Too Far" by Poith. I couldn't find where this bridge is located nor do I know whether or not it really IS unsafe. But SOME definitely are. 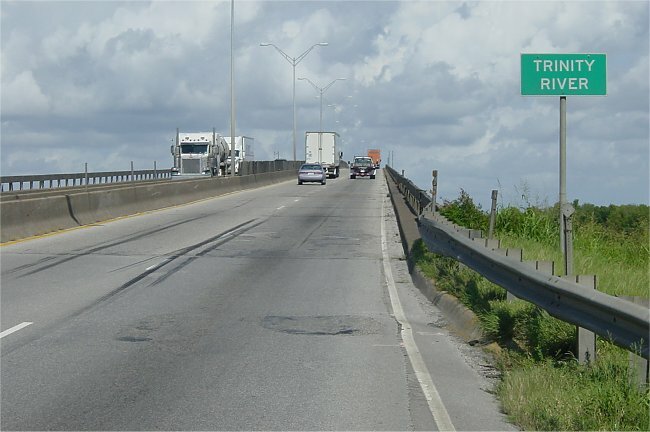 The second substandard bridge photo shows a section of Interstate 10 which traverses the coastal plain east of Houston. It was originally state highway 73, and was one of Texas' first rural highways built to Interstate standards in the 1950's. Most of this section has been reconstructed to a modern 6-lane facility in the last 10 — 15 years. However, the Trinity River Bridge is still the original, substandard bridge dating from the 1950's. A $40 million bridge replacement project, as well as several other projects to upgrade adjacent 4-lane sections to 6 lanes, is planned. However, the bridge and most of the expansion projects are unfunded, so they will not start construction within 5 years. This region receives 50 — 55 inches of rain per year, one of the wettest regions of Texas. The last substandard bridge photo is of an 8-foot hole on I-44 in Tulsa, Oklahoma. The 122-foot steel span, built in 1958, is rated as structurally deficient. Its deck is rated in serious condition. Fortunately, it is scheduled for replacement. The federal Department of Transportation lists 151,394 US bridges as structurally deficient or functionally obsolete. That’s 25% of American bridges. But fear not: bridges are becoming safer. There were 3,930 fewer such bridges in the US in 2008 than in 2007. Whew. That’s a relief. At this rate, America will have no unsafe or obsolete bridges in only 153 years. According to the Department of Transportation, a total of $21 billion was appropriated for the federal Highway Bridge Program from 2005 to 2009 to repair or replace deficient bridges — an annual average of just over $4 billion. However, the American Society of Civil Engineers says that simply maintaining the current overall level of bridge conditions — that is, not allowing the backlog of deficient bridges to grow — requires a combined investment from the public and private sectors of $650 billion over 50 years, for an average annual investment level of $13 billion. The cost of eliminating all existing bridge deficiencies as they arise over the next 50 years is estimated at $850 billion in 2006 dollars, equating to an average annual investment of $17 billion. Where will the money come from? Far too much has already been spent elsewhere. The first of the Overtaxed Bridges is an old bridge across the Fujiang River in the southwest municipality of Chongqing. If a bridge is too far gone to repair, you can have lots of fun by blowing it up and letting all the rubble drop down into the water. It was destroyed on 5 January 2009. The 762-metre-long bridge was opened to traffic in 1971, but a higher bridge was needed was to allow bigger ships to pass through. Besides, now no one can escape. Or maybe they just can't escape very fast. In the final photo, early morning traffic crosses the Huanhuayuan Bridge across the Jialing, also in southwest China's Chongqing municipality, on 28 July 2010. China's car production and sales will both exceed 15 million units this year, so the bridge traffic situation is likely to get worse, not better. The complete and even coverage of the fire, along with the dense black smoke, is an indication that the bridge was treated with creosote (or something similar) to retard decay. However, it certainly doesn't do much to retard fires, I see. Bojangles Bar is in the upper centre and the Green Room Lounge is at the lower right. There are no bridges in folk songs because the peasants all died while building them.